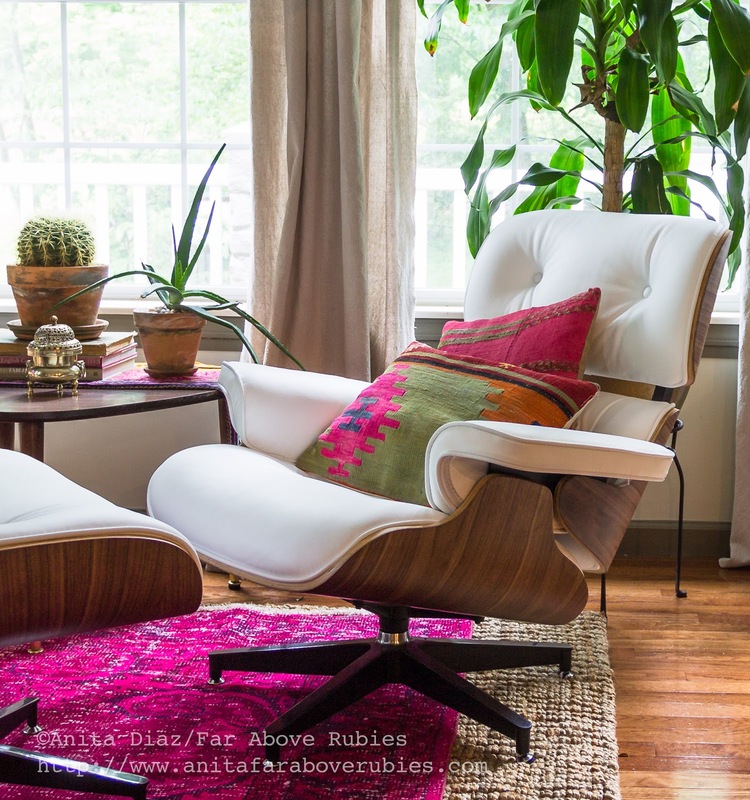 I love mid-century anything and have been looking at the Eames chair and ottoman for a while. I know my husband also loves that style, so I thought it would be a nice chair for him to relax in. Charles and Ray Eames often visited their friend Billy Wilder on his film sets. While working, the famed director would put together a makeshift lounge chair so that he could nap between takes. Something about his jerry-rigged seat struck a chord with the duo. The couple already had significant experience working with plywood. Applying heat and pressure, Charles and Ray had molded it for use by the U.S. Navy during WWII. Following the war, they continued to experiment with the material. 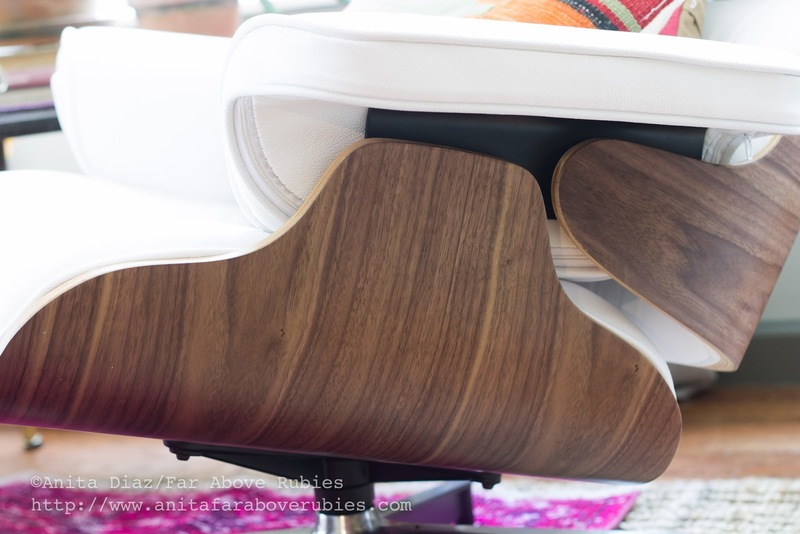 The resulting smooth curves of molded plywood on the Eames Lounge and Ottoman were unprecedented in furniture design at the time. The chair is upholstered in leather and has an aluminum base. When it debuted on Arlene Francis’ Home show in 1956, she called it “quite a departure” from the designers' earlier creations. The lounge set came about during a period of very spare and minimal furniture, but Charles was insistent on building a chair with “the warm receptive look of a well-used first baseman's mitt,” one that would provide respite from the “strains of modern living.” In a letter to Charles, Ray wrote that the chair looked “comfortable and un-designy.” Despite its humble origins, the Eames Lounge and Ottoman are in the permanent collection of New York’s Museum of Modern Art. The first completed set was gifted to Billy Wilder, and is produced by Herman Miller. 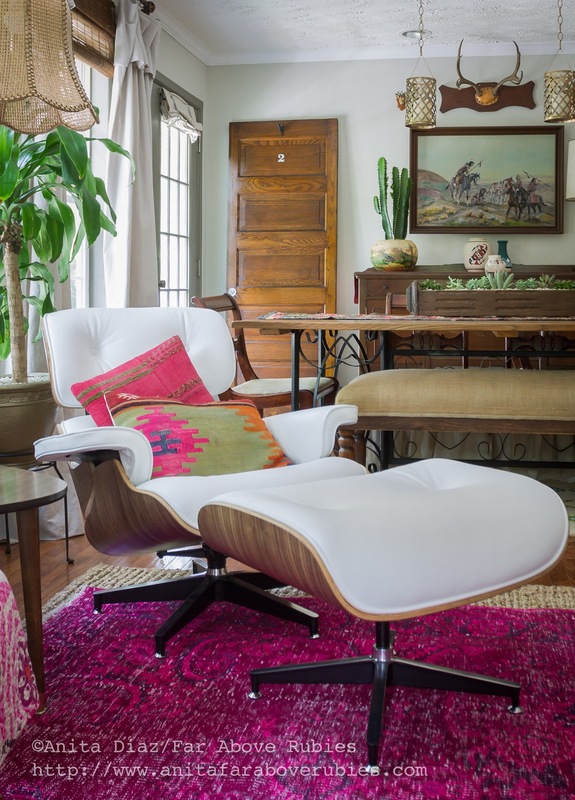 As much as I love this chair and ottoman, the original Herman Miller Eames lounge and ottoman is *way* out of my price range at $4,935. So I found similar knock-off chair from Artisdecor in California at a fraction of the cost and free shipping. It was listed at $690, but I got it for $552. 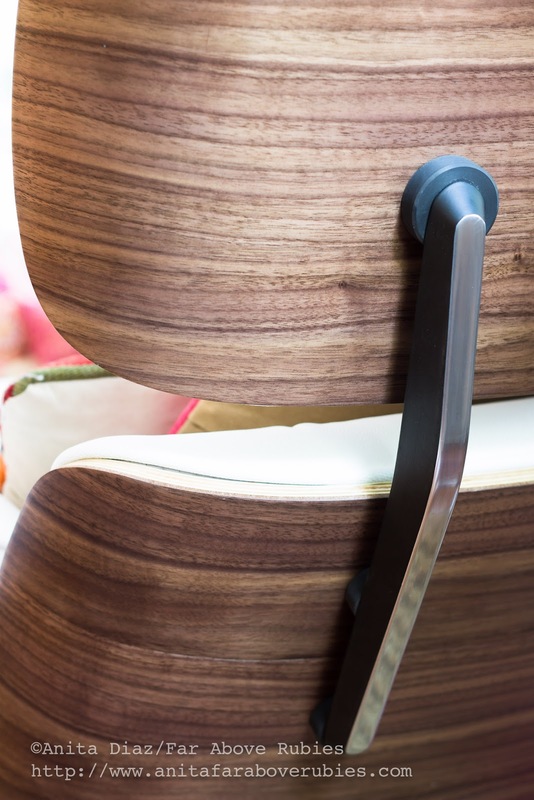 It is a beautiful chair with 100% top grain leather and walnut stained wood. It came in about a week and was fairly simple to put together. I just love the look, and it really is comfortable. It is also seriously well made, and I'm sure we will all enjoy it for years to come. I wanted black leather, but my husband liked the white better, and I'm really glad I didn't get black -- now that I see the white one in the room. Y'all know we don't spend money ever, so this was a splurge and Father's Day gift to my husband because he is just so awesome:-) He really is, and I am blessed to share life with him. That is an awesome chair and what a great gift to your hubby! that is a beaut! How did you manage the discount pray tell. 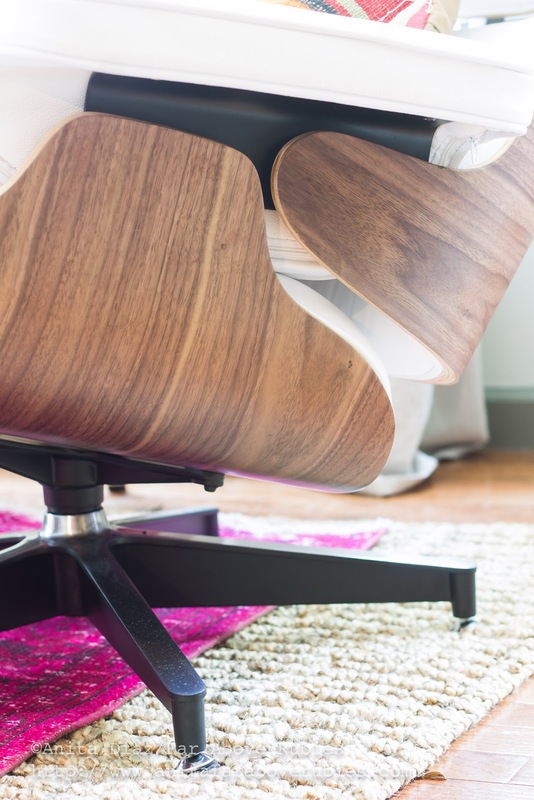 My husband has worked at Herman Miller for 38 years and the Eames chair and ottoman is just one of many beautiful mid-century furniture pieces created by Herman Miller. Herman Miller's Eames chair is not a "reproduction" as you stated but the company you purchased from is considered a "knock-off" from the original Eames design. Yes, Julie, I know it's not an original, and I stated it was "similar" to the original. So I will remove "reproduction" and fix that mistake. I could not begin to afford an original one. That is a beautiful chair and I love the white! It looks beautiful in your room! Wow, im loving this chair. Thanks Jo May! We are loving it too! 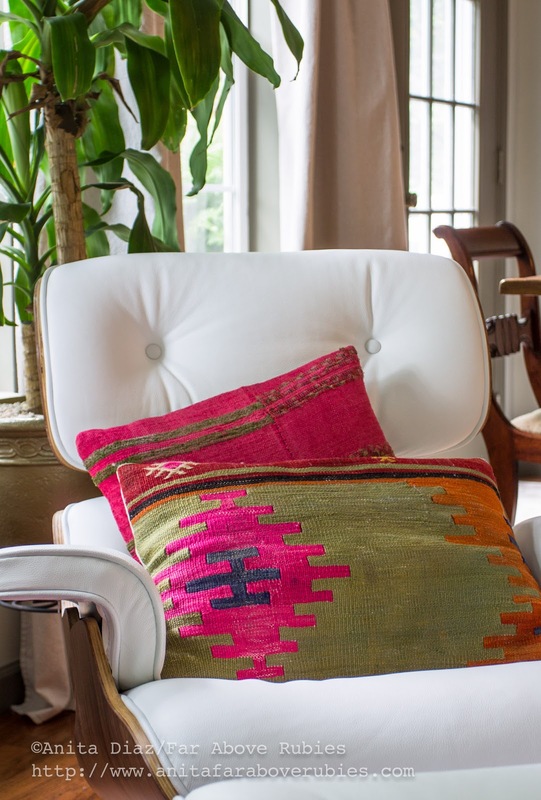 that chair is SO dreamy! i am in love! It looks wonderful in your home. My dad was an architect and I grew up in a Frank Lloyd Wright type of mid century modern house. My dad had an Eames chair in brown leather. Thank you so much Isora!! Now that is one awesome chair, Anita! A real classic. The white leather is absolutely stunning with the bright accent pillows. 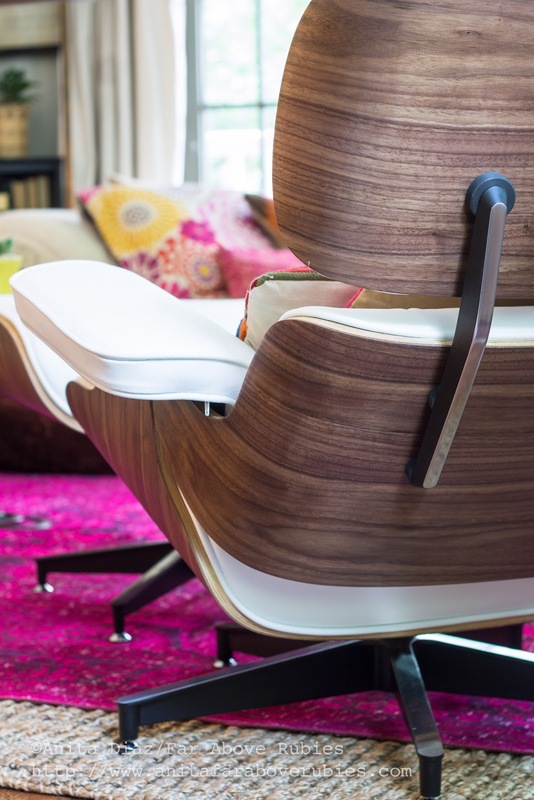 Stunning design & styled by Ray and Charles Eames. 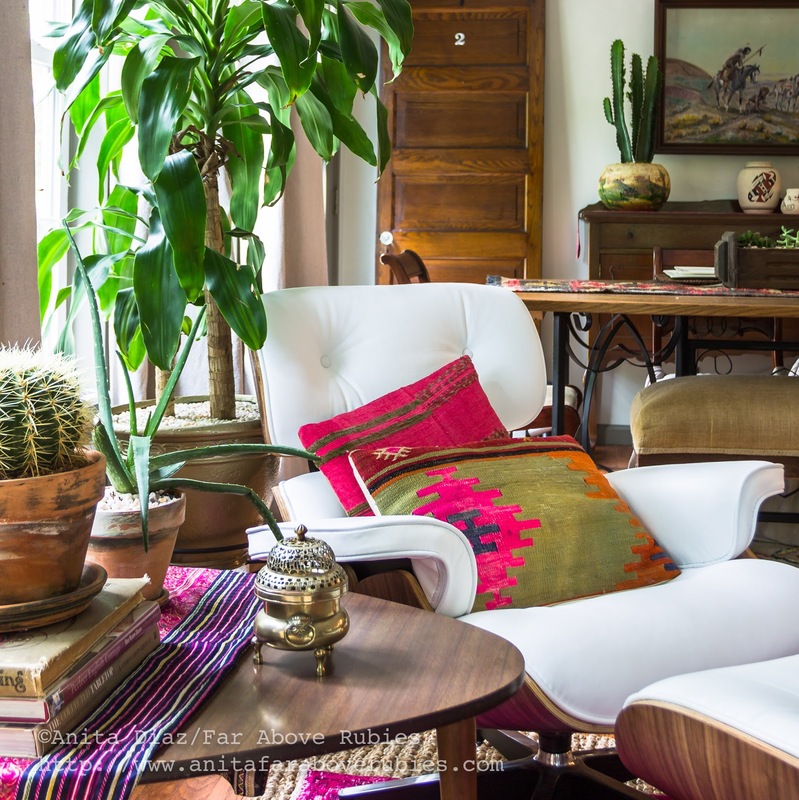 Gorgeous chair, Anita! The design of that chair has stood the test of time. I used to see it quite frequently in Elle Decor magazine. That's a true classic; and it looks amazing in your home!